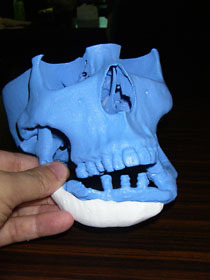 Researchers from the Tissue Engineering Department at the University of Tokyo Hospital and venture company Next 21 are using 3D inkjet printers to produce tailor-made artificial bones for use in facial reconstructive surgery. Following initial trials performed on a Welsh corgi and 10 people over the past year and a half, the researchers are set to begin a more extensive second round of human testing this autumn. To make an artificial bone with this technology, a 3D computer model of the bone is first created based on the patient's X-ray and CT scan data. The computer model is then sliced into a large number of cross-sections and the data is sent to a special 3D inkjet printer, which works sort of like an ordinary inkjet printer by transferring tiny droplets of liquid onto a surface. However, unlike ordinary printers that print on paper, this one prints onto thin layers of powdered alpha-tricalcium phosphate (alpha-TCP). The "ink" is a water-based polymer adhesive that hardens the alpha-TCP it comes into contact with. By repeatedly laying down the powder and printing successive layers on top of one another, the printer is able to physically reproduce the desired bone to an accuracy of one millimeter. The next round of human trials will be conducted at Dokkyo Medical University, Saitama Medical University, Tokyo Dental College, University of Tokyo, Juntendo University, Tsurumi University, Kyoto University, Osaka Medical College, Kobe University and Osaka City General Medical Center. The researchers hope to make the technology commercially available by 2010. After 3 years I'd love to see what they're up to today! There is also a company called Synthes that does similar work with printers in the field. 3D εκτυπωτ?ς τυπ?νει οστ?! « ? ????????????? ?????????? ?? ??????? ??? internetakias.gr » Blog Archive » 3D ????????? ??????? ???? !